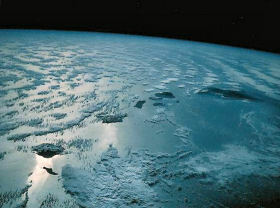 The Hawaiian High Islands Ecoregion lies in the north central Pacific Ocean. It is comprised of the ecological systems, natural communities, and species associated with the terrestrial portion of the main archipelago of the Hawaiian Islands (eight major islands and immediately surrounding islets). These islands have a total land area of 1,664,100 hectares (4,062,660 acres). This terrestrial ecoregion excludes the Northwestern Hawaiian Islands (belonging to Hawai‘i coastal/marine ecoregion) and the surrounding marine environment. The Hawaiian High Islands Ecoregion lies within the Hawaiian Biogeographic Province, which encompasses all of the above ecoregions and occupies the northern portion of the Oceanian Realm. 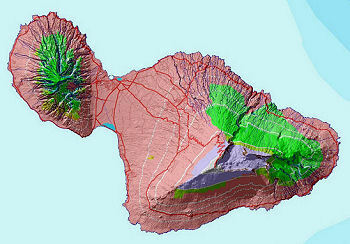 The Hawaiian High Islands Ecoregion Boundary is defined by the TNC/NatureServe National Ecoregional Map. 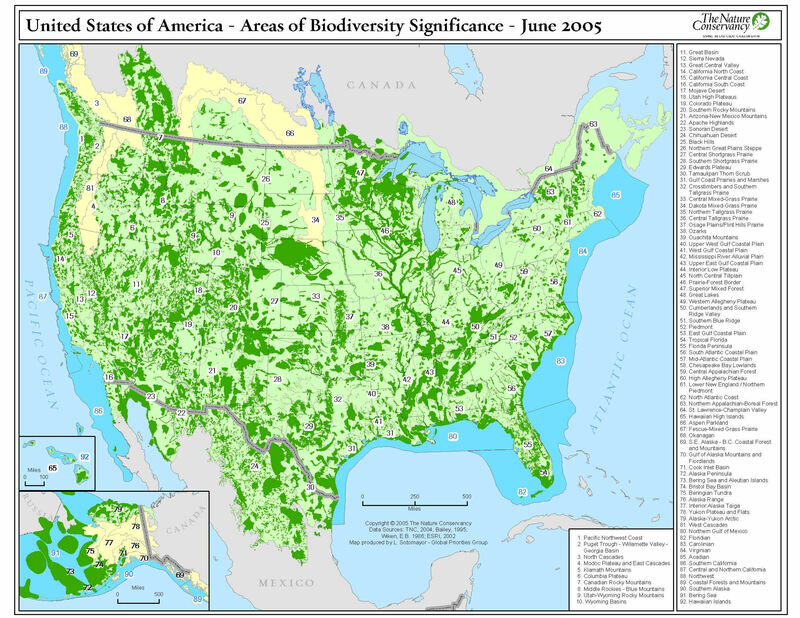 It is a modification of Bailey's Ecoregions of the United States. The World Wildlife Federation (WWF) recognizes four ecoregions for the Hawaiian Islands (Hawai‘i Tropical Moist Forest [OC0106], Hawai‘i Tropical Dry Forest [OC0202], Hawai‘i Tropical High Shrubland [OC0701], and Hawai‘i Tropical Lowland Shrubland [OC0702]) (Gon & Olson 1999, Ricketts et al 1998). The Hawaiian High Islands Ecoregion contains three major habitat types: Tropical Moist Broadleaf Forest, Tropical Dry Broadleaf Forest, and Tropical Grasslands, Savannas & Shrublands. The boundaries of the Hawaiian High Islands Ecoregion correspond to the collective sea-level island boundaries of the main Hawaiian Islands and immediately surrounding islets. There are no contiguous terrestrial ecoregions. The Hawaiian ecoregion contains highly diverse physiography. 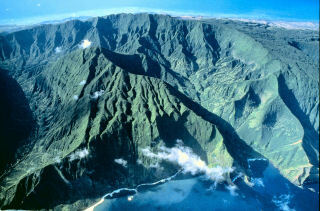 The Hawaiian High Islands Ecoregion is marked by a very wide range of local physiographic settings. These include fresh massive volcanic shields and cinderlands reaching over 4000 m (13,000 ft) elevation; eroded, faceted topographies on older islands; high sea cliffs (ca 900 m [3,000 ft] in height); raised coral plains; and amphitheater-headed valley/ridge systems with alluvial/colluvial bottoms. Numerous freshwater stream systems are found primarily on the older, eroded islands, but also on the wet, windward slopes of even the youngest island, Hawai‘i (Juvik & Juvik 1998). 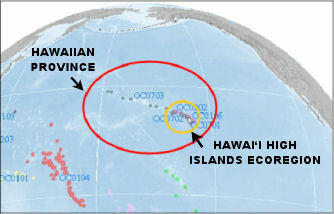 The Hawaiian High Islands Ecoregion (right, yellow oval) lies within the Hawaiian Province (red oval), in the Oceanian Biogeographic Realm. High island orographic climate results in both extremes of wet and dry, while broad elevational reach yields tropical hot to alpine temperature regimes. (Click on the image above to view a larger version). Hawai‘i boasts the highest overall species and ecosystem endemism of any ecoregion. The flora is disharmonic, lacking many of the typical tropical genera and families. Hawai‘i includes more endangered species than any other state of the U.S. 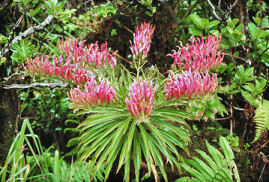 The Hawaiian High Islands Ecoregion is marked by extremely high endemism (e.g., ~90% endemism of native flowering plants; >98% endemism of native terrestrial invertebrates) (Loope 1999). An estimated 15,000 endemic species occur in the ecoregion (Eldredge & Evenhuis 2003). The Hawaiian flora of about 1,200 vascular plant species is disharmonic, that is, lacking many genera and families that typically mark tropical island systems (Sohmer & Gon 1995). Rare and endangered taxa, including endangered plants, forest birds, and land snails comprise >25% of the fauna. 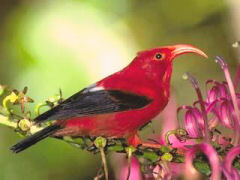 Hawai‘i includes more endangered species than any other state in the U.S. (USFWS 2005). WWF includes the Hawaiian Islands as the site of four of their "Global 200" priority ecoregions (Olson & Dinerstein 1998). In addition to species, all but ahandful of the approximately 150 described terrestrial native natural communities are endemic. Vegetation includes grasslands, shrublands, woodlands,and forests in lowland, submontane, montane, subalpine, and alpine settings (Pratt & Gon 1998). Hawai‘i supports more Holdridge life form categories than any other ecoregion known (Tosi et al 2001, Ewell 2004). Lists of the natural communities and rare/endangered species of the ecoregion can be found in the appendices. 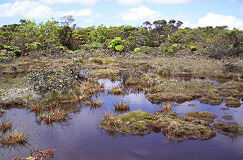 Biological diversity in the Hawaiian Islands is spread among the main high islands because of island-level endemism. Each island contains species unique to that island. For example, of 1,050 described taxa ofnative flowering plants, there are three found only on Ni‘ihau, 225 restricted to Kaua‘i, 157 found only on O‘ahu, 40 known only from Moloka‘i, 12 unique toLāna‘i, 96 found only on Maui, 2 reported only from Kaho‘olawe, and 106 known only from Hawai‘i (Wagner et al 1990). Because of all of these island-level endemics, fewer than half the flowering plant taxa (409) show multi-island dis­tri­bu­tions. Fewer than 150 can be found on all six of the higher main islands. The situation is even more pro­nounced among invertebrates, which comprise the majority of species-level diversity of the ecoregion, and show remarkable diversification and geo­graphic endemism even within a single island setting. Multiple examples of ecological systems across the ar­chi­pelago are clearly required to ade­quate­ly represent species level biological diversity. For broad-scale planning, a geographic stratification approach is needed, and was developed as part of this 2nd interation plan. Significant portions of the lowlands have been displaced by human development. 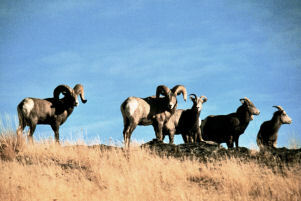 Bringing active management to priority land- scapes is the overall goal. Strong connections between the natural world and indigenous Hawaiian culture can aid conservation. Human residence and extractive land uses are largely concentrated below 600 m (2000feet) elevation. Land uses include high-density urban, residential, agricultural, grazing, and lands dedicated to military training. Higher elevation areas are more natural, are largely zoned for conservation, and include many areas in protective status such as national parks, natural area reserves, forest reserves, preserves, and refuges. Upland watersheds on most of the main islands are included in informal public-private cooperative management areas called watershed partnerships, managed for maintenance and management of forested watershed. Over 30% of the ecoregion is privately-owned, 29% in state holdings, approximately 8% in federal lands, and the remainder in county and other tenure. These proportions also apply to the biologically intact island interiors, necessitating state, federal, and private participation in comprehensive conservation efforts (Hawai‘i GAP 2005). The consequences of past land use practices can be seen on Maui island (figure below). Anthropogenic and alien-dominated regions, shown in pink, dominate the lowlands, while native-dominated ecological systems prevail at higher elevations. Typically there is little or no native vegetation below 600 m (2000 feet) elevation. In mesic settings suitable for grazing, the destruction of forest and replacement by alien grasslands extends to the subalpine zone (e.g., on the upper western flank of East Maui below). The general setting for conservation in Hawai‘i is relatively stable. There is none of the sometimes violent instability that plagues many of the world's tropical biodiversity hotspots. Hawaii's economy is marked by relatively low unemployment, and is largely based on tertiary services related to tourism. The military also plays a large economic role, as Hawai‘i has been a strategic hub since World War II. Plantation agriculture (sugar and pineapple) was the primary economy in the early 20th century, but had greatly declined in importance by the 21st century. Large tracts of former agricultural lands are being converted into residential areas or are left fallow, often creating vectors for weed invasions or wildfire. Rapidly rising land and property costs (among the highest in the U.S.) have created a high cost of living, exacerbated by our geographic isolation and need to import many/most necessities (food, shelter, clothing, fuel). 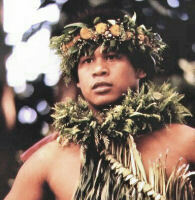 Economically depressed rural areas occur on all islands where subsistence hunting/fishing persists. Business centers can be found in Honolulu (O‘ahu), Kahului (Maui), Līhu‘e (Kaua‘i), Hilo and Kailua-Kona (Hawai‘i). Societal stratification includes everything from the extremely rich to the working poor, with a growing gap between the two. Socio-economic impacts on natural systems can be seen in urban and suburban sprawl that impinges on the boundaries of the Conservation District, continued deforestation in agriculturally-zoned lands on the Island of Hawai‘i in the Kona District, and damage inflicted by military training exercises in and adjacent to native ecological systems (especially on O‘ahu and Hawai‘i islands). Hawai‘i state land use zoning establishes a Conservation District that corresponds well to the remaining native-dominated areas (with some notable exceptions). Government agencies and the public recognize that natural areas and watersheds are important for quality of life. Strong connections between the natural world and indigenous Hawaiian culture hold great potential for conservation. However, conservation and public land management are severely under-funded and a multiple use mandate conflicts with management actions focused on biodiversity conservation. High land costs make conservation acquisition a very expensive strategy, and overall high costs of living apply to the costs of essential management actions.